Help Wanted: No pay, hours can be lousy, and sometimes it stinks. That plea from animal shelters and rescues across the country doesn't sound very appealing. But thousands of volunteers answer the call every day. 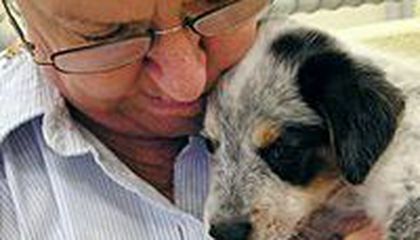 "I don't know how we could function without volunteers," said Robin Starr, who is in charge of the Society for the Prevention of Cruelty to Animals in Richmond, Virginia. Jobs include that often smelly cleanup chore. But every facility also needs people to feed, walk, groom, train, play with and show animals. They also need office and other help. Karen Gammon, 58, donates her art for auctions and the gift store at Starr's shelter. She used a charcoal-smothered canvas and then an eraser to peel away the charcoal. "One year, the bidding got to $11,000, so she agreed to do two drawings at that price, making $22,000 for the shelter," Starr said. At Florida's Humane Society of Vero Beach and Indian River County, Cornelia Perez, 72, started volunteering 60 years ago, when she rode her bike to a shack by the railroad tracks and they let her walk the dogs. She was away for a while, at boarding school, college and an early career, and returned in 1984. She put pails in supermarkets for food donations and coordinated the building campaign for the shelter that replaced the shack. She now volunteers at the state-of-the-art shelter that replaced the building. 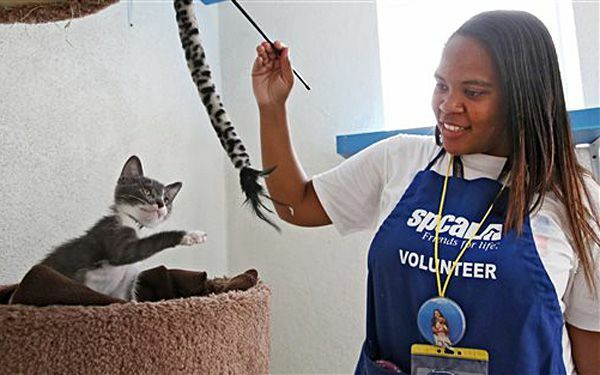 Jourdan Giron, who turns 21 this month, signed up in February for eight hours a month at the SPCA in Los Angeles. She already has put in over 325 volunteer hours, well over the 64 promised. Usually shy, she is comfortable when talking to customers about animals. Giron does those smelly jobs too. She sees it as a matter of faith. "I know," she said, "it's because they trust me to go in the kennels." Critical thinking challenge: Why must shelters depend on volunteers who work for no pay? Why are people willing to work for no pay? Shelters Depend on Volunteers because they usually do not have the money to pay for a regular working staff. Since animal shelters are usually housing animals that were found on the streets, meaning they get tons upon tons of animals all the time. And they have to pay for their food and water, sometimes some of them require medicine and other things because they may be injured. People volunteer out of the caring of the poor animals and they wish to save them or help them feel better in the shelter. Animal shelters depend on volunteers that work for no pay because the animal shelters don't make that much money. Some people will be willing to work for no pay is if they care for the animals enough to not be paid. Shelters depend on the people who work for no pay because they need to spend all the money they can on taking care of the animals. People are willing to work for no pay because they love animals and are willing to help. Shelters must depend on volunteers who work for no pay because shelters need all the money they can get so they can provide for the animals they have. People are willing to work for no pay because they know that they helping the animals and they aren't forced to be there. They actually enjoy spending time and helping the animals and don't feel that they need to get paid. Plus, they most likely understand why they don't get paid anyway. They would do it for the sake of the animals there, the animals need food and water to be happy. Plus who wouldn't want to spend their time playing with cute animals # I want this job! they rely on volunteers because not very many people would have time or want to work at a place like that. And they don,t get paid enough to stay at that job like that. Others would do it for free because they love animals and like to work at places like that. The reason why is because if i worked for a shelter i wouldn't want any money because i would do anything to help or save animal's in health because i love animal's and they should trust volunteer's because who ever wanted to work for helping animal's they must really love animal's and really want to help them. People are wanting to help because some people like animals. If people don't work at a shelter all of the animals wont have a place to live. It is not all about the cash its about the care. and love not about money they made their choice. what will you make for them.